As you all know Down the Memory lane is celebrating its 1st birthday and showcasing artists from different walks of the world and their unique projects. Here's presenting another artist in the list ,the immensely talented Mary". Thanks a lot for being a part of Artist's week. When Nupur asked if anyone would like to help her celebrate I jumped at the chance. Her work is so incredible and who wouldn't like to help her celebrate her first year of blogging? As a fellow Pinquette I also thought it was a great way to use some fabulous Pinque Peacock products. So, I decided what better way to help you see some great flowers, help Nupur celebrate and finish a layout of one of my grand daughters? I call that "winning"!!!! I am so excited to be able to help Nupur Patel celebrate her 1st birthday in the world of blogs. Her blog: Down The Memory Lane, can be found HERE . There have been some wonderful projects so far from some very talented artists, literally from around the world! You read that correctly since this hop origins in India where you can find Nupur and her equally talented family. Don't you just love the internet? Mia is the prime example of a "girlie" girl. For her 5th birthday we had a baking party. I made over 25 aprons for both boys and girls. Each of the kids donned their aprons and set about decorating cookies, cupcakes etc. I have to explain that this was the end of August when we should have had beautiful weather. Instead, we had a tropical storm, the remnants of a Hurricane so the rain was torrential ! We did get through the party and safely home before the power went out, for days...... This theme party was perfect since all activities were indoors. As usual, I digress, lol! I decided to journal around the black background to give a few details about the party. This added to bringing out the stitching on the black ribbon. I also embossed the filigree design on the bottom and went over the raised design with a white gel pen. I wanted to break it up a bit so I added a ribbon with a pink border and white polka dots on the black background. Since Mia loves to bake, I used some mulberry heart dies I had and added a small heart pearl to the center. I must admit that I save a lot of things, including this bow. It had been from a gift I received and I just thought this ribbon would come in handy some day and, it did. 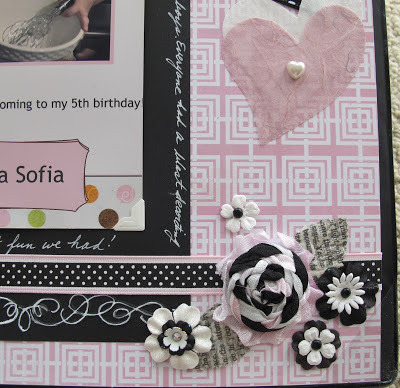 The beautiful pink, silver and black swirl flower is from Pinque Peacock which has wonderful flower embellishments. I had special ordered these from Jessica @ Pinque Peacock's Shop and they were perfect for this layout. That is the great thing about this shop. Jess is so easy to work with and always can custom order exactly what you need. You can get some great embellishments for yourself @ the shop HERE. Down the Memory Lane's 1st Birthday celebration!! YAaaaaaaaaaaY!! All you have to do is follow these simple steps and you have got yourself won this gorgeous "Goodie" that everyone would want to lay their hands on! 4. LIKE, COMMENT & SHARE our everyday's posts too..
*the WINNER will be picked randomly by the "random winner generator"
This is a wonderful... absolutely wonderful layout, Mary!! So truly beautiful. Your little subject is darling!! Thanks for sharing your talents with us. You are such an inspiration! Have a happy day today!! Love this layout Mary. I love the handwriting you did around the frame!! love the black and white combo to! !